For other uses, see Pilgrimage (disambiguation). A pilgrimage is a journey or search of moral or spiritual significance. Typically, it is a journey to a shrine or other location of importance to a person's beliefs and faith, although sometimes it can be a metaphorical journey into someone's own beliefs. Many religions attach spiritual importance to particular places: the place of birth or death of founders or saints, or to the place of their "calling" or spiritual awakening, or of their connection (visual or verbal) with the divine, to locations where miracles were performed or witnessed, or locations where a deity is said to live or be "housed", or any site that is seen to have special spiritual powers. Such sites may be commemorated with shrines or temples that devotees are encouraged to visit for their own spiritual benefit: to be healed or have questions answered or to achieve some other spiritual benefit. A person who makes such a journey is called a pilgrim. As a common human experience, pilgrimage has been proposed as a Jungian archetype by Wallace Clift and Jean Dalby Clift. The Holy Land acts as a focal point for the pilgrimages of the Abrahamic religions of Judaism, Christianity, and Islam. According to a Stockholm University study in 2011, these pilgrims visit the Holy Land to touch and see physical manifestations of their faith, confirm their beliefs in the holy context with collective excitation, and connect personally to the Holy Land. Bahá'u'lláh decreed pilgrimage to two places in the Kitáb-i-Aqdas: the House of Bahá'u'lláh in Baghdad, Iraq, and the House of the Báb in Shiraz, Iran. Later, `Abdu'l-Bahá designated the Shrine of Bahá'u'lláh at Bahji, Israel as a site of pilgrimage. The designated sites for pilgrimage are currently not accessible to the majority of Bahá'ís, as they are in Iraq and Iran respectively, and thus when Bahá'ís currently refer to pilgrimage, it refers to a nine-day pilgrimage which consists of visiting the holy places at the Bahá'í World Centre in northwest Israel in Haifa, Acre, and Bahjí. Kusinara: (now Kusinagar, India) where he attained mahaparinirvana (died). Other pilgrimage places in India and Nepal connected to the life of Gautama Buddha are: Savatthi, Pataliputta, Nalanda, Gaya, Vesali, Sankasia, Kapilavastu, Kosambi, Rajagaha. Thailand: Sukhothai, Ayutthaya, Wat Phra Kaew, Wat Doi Suthep. Tibet: Lhasa (traditional home of the Dalai Lama), Mount Kailash, Lake Nam-tso. Cambodia: Angkor Wat, Silver Pagoda. Sri Lanka: Polonnaruwa, Temple of the Tooth (Kandy), Anuradhapura. Shikoku Pilgrimage, 88 Temple pilgrimage in the Shikoku island. Saigoku 33 Kannon, pilgrimage in the Kansai region. Bandō 33 Kannon, pilgrimage in the Kantō region. Chichibu 34 Kannon, pilgrimage in Saitama Prefecture. Chūgoku 33 Kannon, pilgrimage in the Chūgoku region. Christian pilgrimage was first made to sites connected with the birth, life, crucifixion and resurrection of Jesus. Aside from the early example of Origen in the third century, surviving descriptions of Christian pilgrimages to the Holy Land date from the 4th century, when pilgrimage was encouraged by church fathers including Saint Jerome, and established by Saint Helena, the mother of Constantine the Great. 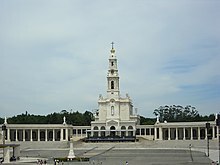 Pilgrimages were, and are, also made to Rome and other sites associated with the apostles, saints and Christian martyrs, as well as to places where there have been apparitions of the Virgin Mary. A popular pilgrimage journey is along the Way of St. James to the Santiago de Compostela Cathedral, in Galicia, Spain, where the shrine of the apostle James is located. A combined pilgrimage was held every seven years in the three nearby towns of Maastricht, Aachen and Kornelimünster where many important relics could be seen (see: Pilgrimage of the Relics, Maastricht). Chaucer's The Canterbury Tales recounts tales told by Christian pilgrims on their way to Canterbury Cathedral and the shrine of Thomas Becket. Kumbh Mela: Kumbh Mela is one of the largest gatherings of humans in the world where pilgrims gather to bathe in a sacred or holy river. The location is rotated among Allahabad, Haridwar, Nashik, and Ujjain. Char Dham (Four Holy pilgrimage sites): The famous four holy sites Puri, Rameswaram, Dwarka, and Badrinath (or alternatively the Himalayan towns of Badrinath, Kedarnath, Gangotri, and Yamunotri) compose the Char Dham (four abodes) pilgrimage circuit. Kanwar Pilgrimage: The Kanwar is India's largest annual religious pilgrimage. As part of this phenomenon, millions of participants gather sacred water from the Ganga (usually in Haridwar, Gangotri, Gaumukh, or Sultanganj) and carry it across hundreds of miles to dispense as offerings in Śiva shrines. Old Holy cities per Puranic Texts: Varanasi formerly known as Kashi (Shiva), Allahabad formerly known as Prayag, Haridwar-Rishikesh (Vishnu), Mathura-Vrindavan (Krishna), Pandharpur (Krishna), Paithan, Kanchipuram (Parvati), Dwarka (Krishna) and Ayodhya (Rama). Major Temple cities: Puri, which hosts a major Vaishnava Jagannath temple and Rath Yatra celebration; Katra, home to the Vaishno Devi temple; Three comparatively recent temples of fame and huge pilgrimage are Shirdi, home to Sai Baba of Shirdi, Tirumala - Tirupati, home to the Tirumala Venkateswara Temple; and Sabarimala, where Swami Ayyappan is worshipped. Shakti Peethas: Another important set of pilgrimages are the Shakti Peethas, where the Mother Goddess is worshipped, the two principal ones being Kalighat and Kamakhya. Pancha Ishwarams - the five ancient Shiva temples of the island from classical antiquity. The Murugan pilgrimage route of Sri Lanka, an ancient Arunagirinathar-traversed Pada Yatra route of Tiruppadai temples includes the Maviddapuram Kandaswamy Temple in Kankesanturai, the Nallur Kandaswamy temple in Jaffna, the Pancha Ishwaram Koneswaram temple in Trincomalee, the Verugal Murugan Kovil on the banks of the river Verugal Aru, in Verugal, Trincomalee District, the Mandur Kandaswamy temple of Mandur (Sri Lanka), Thirukkovil Sithira Velayutha Swami Kovil, in Thirukkovil, Batticaloa, the Arugam Bay and Panamai in Amparai district, the Ukanthamalai Murugan Kovil, in Okanda, Kumana National Park and then through the park and Tissamaharama to the deity's holiest site, Kataragama temple, Katirkamam in the South. 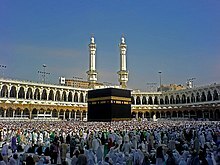 The Ḥajj (Arabic: حَـجّ‎, main pilgrimage to Mecca) is one of the five pillars of Islam and a mandatory religious duty for Muslims that must be carried out at least once in their lifetime by all adult Muslims who are physically and financially capable of undertaking the journey, and can support their family during their absence. The gathering during the Hajj is considered the largest annual gathering of people in the world. Another important place for Muslims is the city of Medina, the second holiest site in Islam, in Saudi Arabia, the final resting place of Muhammad in Al-Masjid an-Nabawi (The Mosque of the Prophet). The third holiest site in Islam, Al-Masjid Al-Aqsa was a major site for pilgrimage where Muslims gather to pray and visit the structures of the holy mosque especially the footprint of Muhammad before he ascended to paradise to meet with deceased prophets. However, due to conflict and disputes between Israel and Palestine the site has been less popular amongst Muslims to go to pilgrimage to in recent years. The Ihram (white robes of pilgrimage) is meant to show equality of all Muslim pilgrims in the eyes of God, that there is no difference between a prince and a pauper. Ihram is also symbolic for holy virtue and pardon from all past sins. Al-Arba‘īn (Arabic: ٱلْأَرْبَـعِـيْـن‎, "The Forty"), Chehelom (Persian: چهلم‎, Urdu: چہلم‎, "the fortieth [day]") or Qirkhī, Imāmīn Qirkhī (Azerbaijani: İmamın qırxı (Arabic: إمامین قیرخی‎), "the fortieth of Imam") is a Shia Muslim religious observance that occurs forty days after the Day of Ashura. It commemorates the martyrdom of Husayn ibn Ali, the grandson of Muhammad, which falls on the 20th or 21st day of the month of Safar. Imam Husayn ibn Ali and 72 companions were killed by Yazid I's army in the Battle of Karbala in 61 AH (680 CE). Arba'een or forty days is also the usual length of mourning after the death of a family member or loved one in many Muslim traditions. Arba'een is one of the largest pilgrimage gatherings on Earth, in which up to 31 million people go to the city of Karbala in Iraq. The second largest holy city in the world, Mashhad attracts more than 20 million tourists and pilgrims every year, many of whom come to pay homage to Imam Reza (the eighth Shi'ite Imam). It has been a magnet for travelers since medieval times. While Solomon's Temple stood, Jerusalem was the centre of the Jewish religious life and the site of the Three Pilgrimage Festivals of Passover, Shavuot and Sukkot, and all adult men who were able were required to visit and offer sacrifices (korbanot) at the Temple. After the destruction of the Temple, the obligation to visit Jerusalem and to make sacrifices no longer applied. The obligation was restored with the rebuilding of the Temple, but following its destruction in 70 CE, the obligation to make a pilgrimage to Jerusalem and offer sacrifices again went into abeyance. The western retaining wall of the Temple Mount, known as the Western Wall or "Wailing" Wall, is the remaining part of Second Jewish Temple in the Old City of Jerusalem is the most sacred and visited site for Jews. Pilgrimage to this area was off-limits to Jews from 1948 to 1967, when East Jerusalem was under Jordanian control. There are numerous lesser Jewish pilgrimage destinations, mainly tombs of tzadikim, throughout the Land of Israel and all over the world, including: Hebron; Bethlehem; Mt. Meron; Netivot; Uman, Ukraine; Silistra, Bulgaria; Damanhur, Egypt; and many others. Sikh pilgrim at the Harmandir Sahib (the Golden Temple) in Amritsar, India. The Sikh religion does not place great importance on pilgrimage. Guru Nanak Dev was asked "Should I go and bathe at pilgrimage places?" and he replied: "God's name is the real pilgrimage place which consists of contemplation of the word of God, and the cultivation of inner knowledge." Eventually, however, Amritsar and Harmandir Saheb (the Golden Temple) became the spiritual and cultural centre of the Sikh faith, and if a Sikh goes on pilgrimage it is usually to this place. The Panj Takht (Punjabi: ਪੰਜ ਤਖ਼ਤ) are the five revered gurdwaras in India that are considered the thrones or seats of authority of Sikhism and are traditionally considered a pilgrimage. Mazu, also spelled as Matsu, is the most famous sea goddess in the Chinese southeastern sea area, Hong Kong, Macau and Taiwan. Mazu Pilgrimage is more likely as an event (or temple fair), pilgrims are called as "Xiang Deng Jiao" (pinyin: xiāng dēng jiǎo, it means "lantern feet" in Chinese), they would follow the Goddess's (Mazu) palanquin from her own temple to another Mazu temple. By tradition, when the village Mazu palanquin passes, the residents would offer free water and food to those pilgrims along the way. There are 2 main Mazu pilgrimages in Taiwan, it usually hold between lunar January and April, depends on Mazu's will. Baishatun Mazu Pilgrimage: this pilgrimage can be traced to 1863, from Baishantun (Miaoli County) to Beigang (Yunlin County) and return, not over a definite route. Dajia Mazu Pilgrimage: from Dajia (Taichung City) to Xingang (Chiayi County) and return, it runs over a definite route. In Iran, there are pilgrimage destinations called pirs in several provinces, although the most familiar ones are in the province of Yazd. In addition to the traditional Yazdi shrines, new sites may be in the process of becoming pilgrimage destinations. The ruins are the ruins of ancient fire temples. One such site is the ruin of the Sassanian era Azargoshnasp Fire Temple in Iran's Azarbaijan Province. Other sites are the ruins of fire temples at Rey, south of the capital Tehran, and the Firouzabad ruins sixty kilometres south of Shiraz in the province of Pars. Atash Behram ("Fire of victory") is the highest grade of fire temple in Zoroastrianism. It has 16 different "kinds of fire", that is, fires gathered from 16 different sources. Currently there are 9 Atash Behram, one in Yazd, Iran and the rest in Western India. They have become a pilgrimage destination. In India the cathedral fire temple that houses the Iranshah Atash Behram, located in the small town of Udvada in the west coast province of Gujarat, is a pilgrimage destination. The main pilgrimage sites associated with the spiritual teacher Meher Baba are Meherabad, India, where Baba completed the "major portion" of his work and where his tomb is now located, and Meherazad, India, where Baba resided later in his life. ^ Cleft, Jean Darby; Cleft, Wallace (1996). The Archetype of Pilgrimage: Outer Action With Inner Meaning. The Paulist Press. ISBN 0-8091-3599-X. ^ a b Smith, Peter (2000). "Pilgrimage". A concise encyclopedia of the Bahá'í Faith. Oxford: eworld Publications. p. 269. ISBN 1-85168-184-1. ^ Werner, Karel (1994). A popular dictionary of Hinduism. Richmond, Surrey: Curzon. ISBN 0700702792. Retrieved 30 October 2016. ^ Thangham, Chris V. (2007-01-03). "Photo from Space of the Largest Human Gathering in India". Digital Journal. Retrieved 2014-03-22. ^ Banerjee, Biswajeet (2007-01-15). "Millions of Hindus Wash Away Their Sins". The Washington Post. Retrieved 2014-03-22. ^ "Millions bathe at Hindu festival". BBC News. 2007-01-03. Retrieved 2014-03-22. ^ Singh, Vikas (2017). Uprising of the Fools: Pilgrimage as Moral Protest in Contemporary India. Stanford University Press. ^ Long, Matthew (2011). Islamic Beliefs, Practices, and Cultures. Marshall Cavendish Corporation. p. 86. ISBN 978-0-7614-7926-0. Retrieved 2 September 2014. ^ Nigosian, S. A. (2004). Islam: Its History, Teaching, and Practices. Indiana: Indiana University Press. p. 110. ISBN 0-253-21627-3. ^ "Islamic Practices". Berkley Center for Religion, Peace & World Affairs. Retrieved 7 April 2017. ^ Mosher, Lucinda (2005). Praying: The Rituals of Faith. Church Publishing, Inc. p. 155. ISBN 9781596270169. Retrieved 18 September 2014. ^ Ruiz, Enrique (2009). Discriminate Or Diversify. PositivePsyche.Biz Corp. p. 279. ISBN 9780578017341. ^ Katz, Andrew (16 October 2013). "As the Hajj Unfolds in Saudi Arabia, A Deep Look Inside the Battle Against MERS". Time. Retrieved 17 October 2013. ^ Ariffin, Syed Ahmad Iskandar Syed (2005). Architectural conservation in Islam: case study of the Prophet's Mosque (1st ed.). Skudai, Johor Darul Ta'zim, Malaysia: Penerbit Universiti Teknologi Malaysia. ISBN 9835203733. Retrieved 30 October 2016. ^ Aljazeera. "alJazeera Magazine – 41 Martyrs as More than Million People Mark 'Arbaeen' in Holy Karbala". Aljazeera.com. Retrieved 2010-06-30. ^ "Powerful Explosions Kill More Than 40 Shi'ite Pilgrims in Karbala". Voanews.com. 2010-02-05. Retrieved 2010-06-30. ^ "The Western Wall". mosaic.lk.net. Retrieved 6 June 2017. ^ "The Western Wall: History & Overview". www.jewishvirtuallibrary.org. Retrieved 27 March 2018. ^ See David M. Gitlitz and Linda Kay Davidson, Pilgrimage and the Jews (Westport, CT: Praeger, 2006) for history and data on several pilgrimages to both Ashkenazi and Sephardic holy sites. ^ "Sikhism". Archived from the original on 23 November 2001. ^ "Special train to connect all five Takhats, first run on February 16". Retrieved 5 February 2014. ^ "~ 大甲媽祖遶境進香歷史沿革、陣頭、典禮、禁忌的介紹~". 淨 空 禪 林 (in Chinese). 2018-05-21. ^ Hartman, Sven S. (1980). Parsism: The Religions of Zoroaster. BRILL. p. 20. ISBN 9004062084. ^ a b Shelar, Jyoti (2017-12-01). "Pilgrimage or mela? Parsis split on Udvada festival". The Hindu. Retrieved 2017-12-21. ^ Deshmukh, Indumati (1961). "Address in Marathi." The Awakener 7 (3): 29. This page was last edited on 15 April 2019, at 17:17 (UTC).